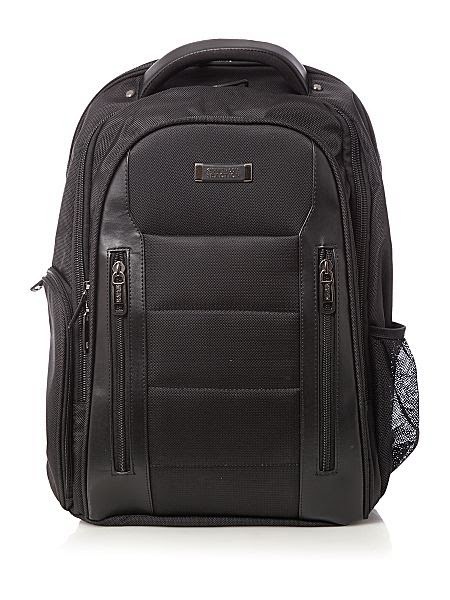 I'm constantly striving for the travelling nirvana - packing lite and having just the right bag for the job - so this Kenneth Cole Reaction Gusset Backpack is a welcome addition to the range. It's been sent to me by House of Fraser who are currently selling it for £60 (as opposed to £100) and judging by the robust zips, firm, padded pockets and variety of compartments that represents good value for money. Empty, the backpack weighs next-to-nothing (sorry, non-technical language for it registers so little on my bathroom scales I can't calibrate the weight) yet seems as strong as it would need to be to both pack and protect a variety of gadgets, leads and other gizmos. Multitudinous zips and pockets also allow for stuff to be safety and protectively stashed away (there's nothing worth than a lot of gear getting bashed about in one big bag) yet the design is generous enough (and non-specific) to allow you to adapt it to whatever kit you need to carry.